Most companies have massive amounts of data at their disposal, yet fail to utilize it in any meaningful way. But a powerful new business tool - analytics - is enabling many firms to aggressively leverage their data in key business decisions and processes, with impressive results. In their previous book, Competing on Analytics, Thomas Davenport and Jeanne Harris showed how pioneering firms were building their entire strategies around their analytical capabilities. Rather than "going with the gut" when pricing products, maintaining inventory, or hiring talent, managers in these firms use data, analysis, and systematic reasoning to make decisions that improve efficiency, risk-management, and profits. 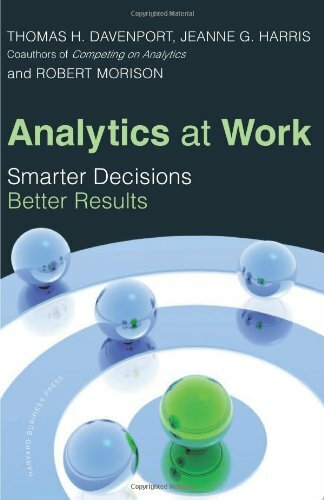 Now, in Analytics at Work, Davenport, Harris, and coauthor Robert Morison reveal how any manager can effectively deploy analytics in day-to-day operations—one business decision at a time. They show how many types of analytical tools, from statistical analysis to qualitative measures like systematic behavior coding, can improve decisions about everything from what new product offering might interest customers to whether marketing dollars are being most effectively deployed. Combining the science of quantitative analysis with the art of sound reasoning, Analytics at Work provides a road map and tools for unleashing the potential buried in your company's data.